﻿ Valley Gem Sternwheeler - Ohio. Find It Here. 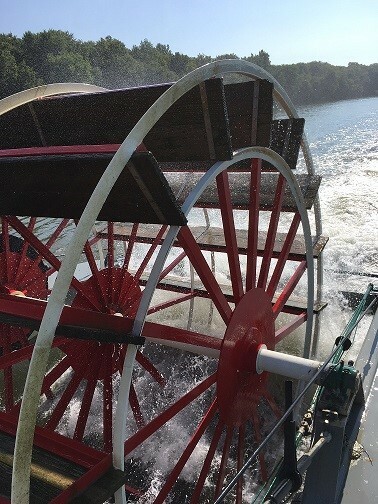 The gentle splash of the paddlewheel reminds you of a bygone era, but this modern-day sternwheeler has all the amenities to make your sentimental journey tranquil and relaxing. The Gem is a clean and comfortable boat, United States Coast Guard Approved and Handicapped Accessible. The lower deck is climate controlled and houses a snack shop, and restrooms. She is able to carry up to 296 passengers. Unwind and be inspired aboard the Valley Gem. Tickets for 90-minute sightseeing cruises, which depart at noon, can be purchased while boarding.Charters are available at all times except during scheduled trips. Check the Valley Gems website for complete details.